Terrible comedy that completely wastes some actors I usually like (e.g. Sarah Silverman, Rainn Wilson, Ben Schwartz). I don’t remember laughing once. This entry was posted in 2, 2010, Reviews and tagged Film, Movie Reviews, Movies on January 5, 2014 by moviesandbacon. It’s so stupid, so cheap, so full of bad acting, so ridiculous, so objectively terrible… and yet these are the qualities that make it a wonderfully entertaining experience (if watched with the right attitude and expectations). I don’t need to explain the premise – it’s all there in the title. The hokey special effects and hokier dialogue are hilarious. One climactic moment involving a chainsaw is perhaps the coolest thing I’ve ever seen. It’s fun to watch Tara Reid’s face closely when she’s on-screen to see if all the work she’s had done has left her with any capacity to change her facial expression. Other than her, the only person I recognised was John Heard (from The Sopranos and the first two Home Alone movies), and even he’s laughably bad in this. 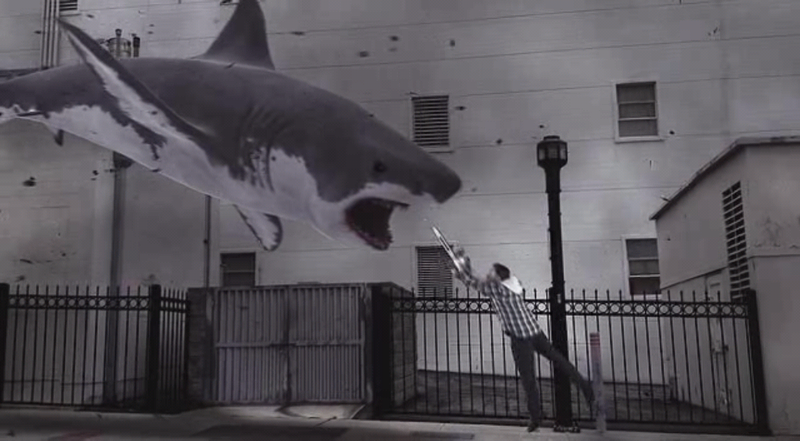 I’m not sure it will end up having the staying power of The Room in the best worst movie stakes, but I sure am looking forward to Sharknado 2: The Second One (yes, that’s the official title). This entry was posted in 2, 2013, 8, Cinema Cheung, Reviews and tagged Film, Movie Reviews, Movies on January 5, 2014 by moviesandbacon.